You will shop on the Aussie Pouch site, but you will not place your order with them. Rather, you will assemble the order and then email it to ClassWish for us to place. Please follow these easy directions. If you want more supplies than your balance allows, you can make a tax-deductible contribution to your own wish list before or right after you shop. When you have donation funds to use (or are about to add your own funds), go to http://www.aussiepouch.com/. (To see other vendors for other categories, please go to the home page of this ClassWish vendors site). Provide the school address as your billing / shipping address. Then when it asks for credit card info, DO NOT provide that (ClassWish is paying for it; You are only using the cart to assemble an order that you will email ClassWish). 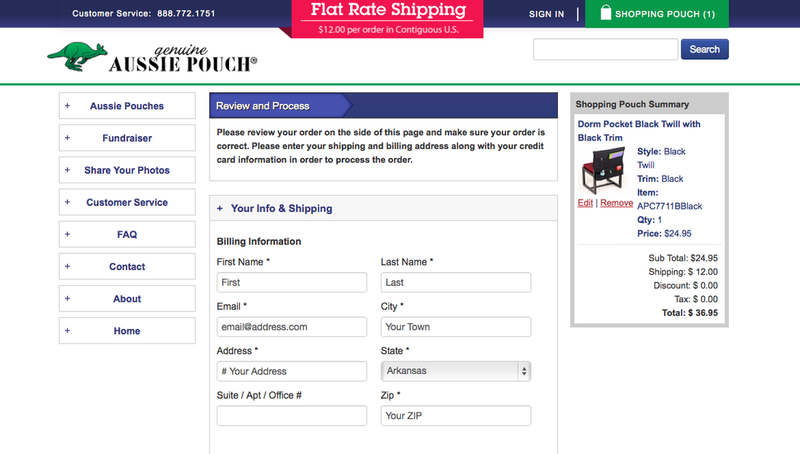 Instead, go BACK to return to the cart page, which will now show the shipping and total cost. Copy and paste the cart into the request form described below. Be sure you include the address, shipping cost, and total. A sample cart image is pasted below. It is the info in the box on the right. Be sure to include the products and all the pricing info. We will submit the order to Aussie Pouch and pay for it. Hovercam will ship the items to you at your school.